With Forest Whitaker, Luis Guzman, but also Arnold Schwarzenegger… Looking at the cast list suggests that somebody had the good idea to cushion Schwarzenegger’s return to the screen with a bit of talent to make sure there’s something interesting to see between Arnold embarrassing himself. But very soon you start realising that you have not seen Whitaker in a long while, that you cannot remember where you know Guzman from, and it starts to dawn on you that what may look like a great cast at first glance may actually be a desperate attempt of some guys to pay for their mortgage. It is hard to find words to describe how utterly and thoroughly ordinary and uninteresting this film is. It has no surprises, no original moments, and when they thought they managed to come up with a cool idea they just did it two or three times. How often can you shoot somebody driving an obviously very fast car, escaping his enemies by just overtaking them or driving around them??? The effort to bribe the policeman goes wrong? Then you do it again, doubling the price. And one more time. The “super-evil drug lord”, by the way, may be the most idiotic and boring villain in movie history. When I saw that the director’s name was Kim Jee-Woon I was reminded of an old joke among German football fans that there must be two Brazils: one where Dortmund kept buying their talented wizards, and one where Leverkusen kept buying their sluggish sloths. So this director, I think, is not from the same Korea as Kim Ki-Duk or Bong Joon-Ho or Park Chan-Wook – this one must be from a bargain bin in a parallel universe. There is no drama, there is no tension, there is only the crudest sense of humour (that’s even a big word for it), there is no timing, but there is an abundance of strange out-of-place stuff (most oddly an old woman who shows up from nowhere to shoot somebody in the head). As I grew up on dubbed versions of Schwarzenegger movies, I could never really appreciate the utter ineptitude of his acting, as it was buffered by certainly very skilled voice-over actors. 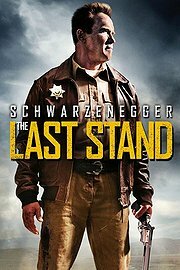 For the first time in decades, I wished I had seen The Last Stand in a dubbed version, whatever language I don’t care. This is unbearable, and terribly boring.